Escaped farmed Atlantic salmon are turning up all over Puget Sound as a wild-fish advocacy group prepared to file a lawsuit. A wild-salmon advocacy group on Friday took the first step toward a lawsuit over the fish-farm escape at Cypress Island last weekend, while fishermen reported finding Atlantic salmon in their nets all over Puget Sound and beyond. Wild Fish Conservancy filed a 60-day notice of intent to sue Cooke Aquaculture Pacific under the Clean Water Act for pollution caused by the fish farm as it collapsed, releasing thousands of invasive Atlantic salmon and debris into Puget Sound. Meanwhile the chairman at Makah Nation in Neah Bay reported more than 30 Atlantic salmon netted in the Seiku River Friday at the tribe’s reservation in the farthest Northwest tip of the state. The Swinomish tribal chairman reported Atlantics turning up in a test fishery in the Skagit Wednesday night. Fishermen from Lopez Island to Alki to Ballard caught Atlantic salmon Thursday. 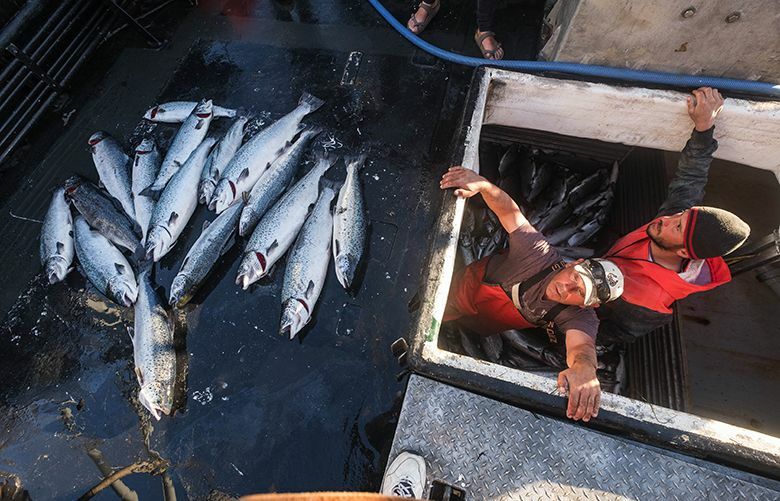 At Lummi Nation, fishermen pulled in about 50,000 pounds of Atlantic salmon Friday, at times nearly swamping their boats, said Councilman Jay Julius, calling from fishing grounds Friday night. Sport anglers on the banks though were frustrated, Julius said, as the farmed fish, used to pellets, won’t bite hooks. The tribe declared a state of emergency Thursday and is paying buyers to take the fish, which are in the tribe’s home waters at Bellingham Bay and the Nooksack River. The tribe is concerned the Atlantic salmon will compete with native fish for food and habitat and about the potential spread of disease. Once the salmon spill is contained, “then we will look at future action,” Ballew said. Brian Cladoosby, chairman at Swinomish, has called for a shutdown of the open-water farmed salmon industry in Puget Sound waters. Tom Wooten, Tribal Chairman for the Samish Indian Nation, in a statement released Friday said the tribe “is beyond disappointed” at the spill. 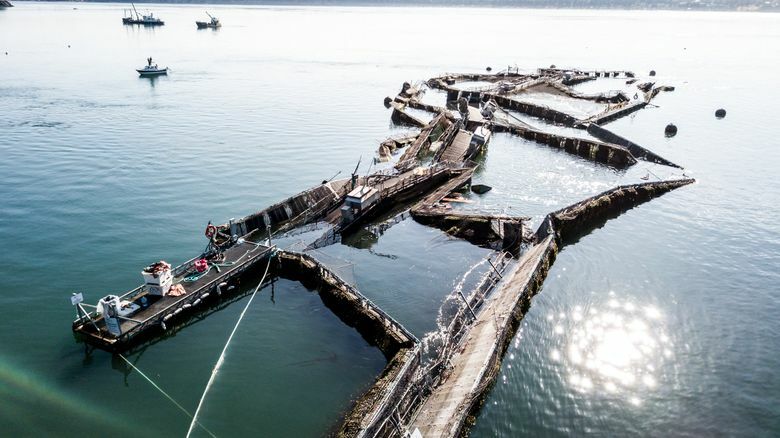 The accident began Aug. 19 and continued into Sunday, when one of three net pens at Cooke Aquaculture’s Cypress Island facility in the San Juan Islands collapsed. Nearly a week later, neither the company nor Washington Department of Fish and Wildlife has an estimate of how many of the 305,000, 8- to 10-pound Atlantic salmon at the farm escaped. The company this week worked to stabilize the structure with additional chains, lines and mooring points. By Friday afternoon the company had pumped 5,166 fish out of the net pens and was attempting to recover more, according to an update published Friday on the website of the Washington Department of Natural Resources, which leases the public’s bedlands in Puget Sound over which the global, Canadian corporation operates its farm. A crane barge will be used beginning Saturday to remove broken walkways and other debris at the site and to lift nets to the surface to get out more fish. Cooke Aquaculture is based in Blacks Harbor, New Brunswick, near the Bay of Fundy, and is the largest farmed salmon operation in North America with farms in Atlantic Canada, Maine and Washington, as well as Chile and Scotland. Cooke has a variety of brands, including True North Seafood, and purchased its eight farms in Washington from Icicle Seafoods last year. It has 80 employees in Washington and its salmon farms in Puget Sound generated $31.5 million in sales for the company last year, according to company spokeswoman Nell Halse. The damaged pen at the Cypress Island farm began drifting last month and the company repaired it, Halse said in an interview. The company believed the structure could last at least until harvest, a few months away. Instead on Aug. 19 it began drifting again and on Aug. 20 the structure collapsed entirely. “The failure has resulted in and continues to result in discharge of farmed Atlantic salmon, dead fish carcasses, and massive amounts of debris among other pollutants,” the conservancy wrote in its notice. Tide data on the days of the events were well within normal and predictable levels and actually lower than on previous months, the letter noted. The company’s claim that the incident was caused by unusually high tides coincident with the Aug. 21 solar eclipse has been widely ridiculed and tide data do not support it. “Wild Fish Conservancy is bewildered by the company’s claim that the solar eclipse, an event which showed no recorded impact on the tides, presented a tidal occurrence that they could have prepared for,” the notice stated. The company has since expanded its explanation to say not only tides were to blame and that it will be doing its own investigation of the matter. Sen. Reuven Carlyle, D-Seattle, also has called for a legislative investigation of the incident. Nick Gayeski, fisheries scientist for the conservancy, warned that the escaped fish are likely to compete with native Pacific salmon and steelhead, and prey on their young, as well as enter Puget Sound rivers and attempt to spawn. Puget Sound chinook are a threatened species, protected under the federal Endangered Species Act. Cooke had no immediate response to the letter, Chuck Brown, communications manager for Cooke, wrote in an email to The Seattle Times.